Taking a little time to play with words, to play with food, and just to play! If you're looking for Olson family updates, then visit our family blog, I Love You Same. The rants and recipes found here are solely mine. We brought home some amazing cheese from Thunder Oak Cheese Farm in Thunder Bay, Ontario. We got to peek inside their kitchen and it was fascinating. What an amazing place. Do stop by if you're in the neighborhood. The location of this farm is unbelievably beautiful. Surrounded by mountains and gorgeous fields, I was tempted to become a Canadian farmer! We bought their rejects ends and pieces. I'm just way to frugal to pay full price! This was a great way to sample many different flavors. We really loved the Extra Old Gouda, the Nettle, and the Cumin and Clove (weird, but delicious!). Arriving home to the terrible news that my best nursing school friend, Angi, had died, I didn't feel much like cooking. In fact, I didn't feel much like eating. These cheese and crackers along with the recipe, below, made for a quick and simple meal. It was one of the first things I was able to eat. Now, Angi, I know, would have made a fantastic face at this recipe. "What the hell, Beavis? Figs!!???" I'd give anything just to be able to share it with her. Fresh figs are only in sason a short time. I adore them and look forward to their arrival every year. We were served something like this at the New Scenic Cafe in Duluth, Minnesota. It didn't take me long to figure out just how simple and delicious this recipe really is. a baguette, sliced thin. toast if you really want to go over the top, but not necessary. 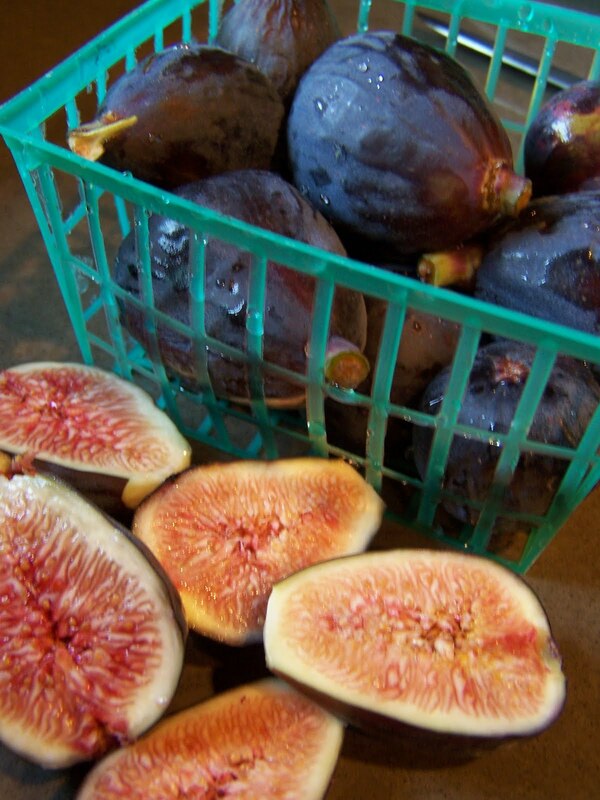 Wash figs, cut in half, set aside. Heat a nonstick pan over medium high heat. Toast walnuts until they're fragrant and delicious smelling (you'll know when, be courageous and just cook by instinct--you can do it). 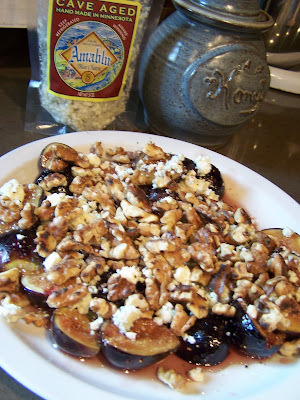 Remove walnuts and set aside. 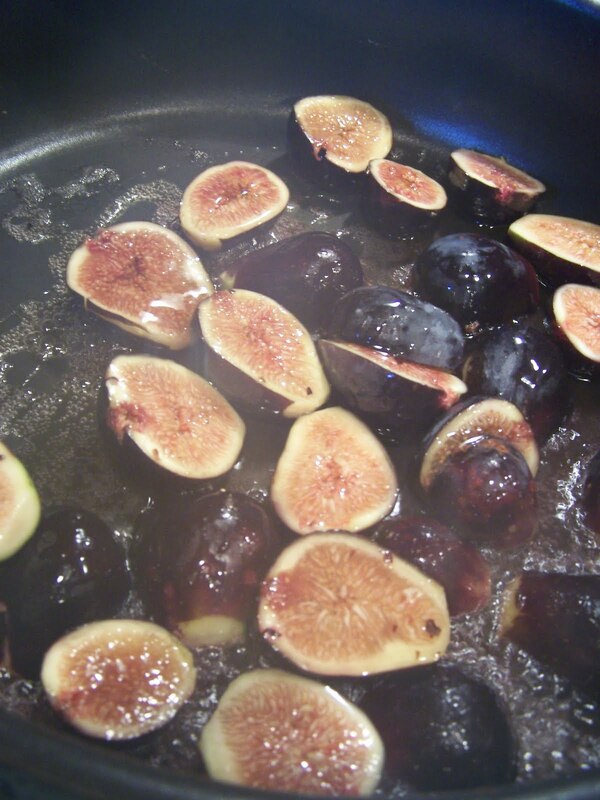 Put pan back on the heat, add figs and cook until they are heated through and the juices start to release. This takes a couple of minutes. Drizzle with honey or maple syrup, and heat through. Place on a serving dish. Sprinkle with bleu cheese and walnuts and serve on thinly sliced baguette. *I use the French spelling. Cause it's way more fun that way. And you can pronounce it BLAH and kids love that. I'm trying really hard to get back into life, but I'm just unbelievably sad. My dear, dear friend Angi passed away suddenly last Monday. We had just returned from a camping getaway to Canada when we heard the news. Angi was 43 years old. I honestly have been speechless only twice in my life. This is one of those times. I want to write about all she meant to me. I want to write about the anger I have that a cardiac critical care nurse can die of a heart attack. I want to write about the ineptitude of doctors and my frustration with White Coat Superiority Complex. I want to write about why women still die of heart disease and how their symptoms are disregarded or diagnosed as hysteria despite how far we've come in other areas of medicine. I want to write about the clinical images I can't get out of my head of my friend, coding on a gurney before emergency angioplasty and lying in a morgue. I want to write about her husband, her teenage daughter, and all her family members and friends whose lives are empty now. But, I can't. I can't minimize this life with mere words. I can hear Angi in my head saying, "snap out of it Beavis", my college nickname from her that somehow remained far longer than her matching Butthead. I suppose not many people remember that show. I can hear her laughter. I can still collapse in laughter because of just one word from her. Puddin' Long story. There is a certain order of things and this just doesn't fit it. I will miss her more each day. Military families make fast friends. Angi told this new Army wife that, "Army wives don't have time for BS." So, we made quick and very deep friendships not because we had to, but because we didn't have time for all the frivolous stuff. The Army moved Angi and Rick on, and we remained behind. I then found out how military families sacrifice way more than the obvious. These fast and deep friendships find you scattered all over the country as people are deployed, discharged, or move on. When others never leave their safe and secure hometowns or stay close in proximity to their college friends, our military families don't. If you can get anything out of this, other than to pay close attention to your heart health, I hope that you can have a deeper understanding of the sacrifices that military families make. I would never have guessed it, if I hadn't lived it. It's not just deployment or the danger of the job, it affects every aspect of your life, for the rest of your life. I remember when I owned my business being floored by the PR and marketing world. While I knew it was pretty bad, I had no idea how bad it truly was. I was shocked by Paid Media vs Earned Media. We never paid for media attention. How silly of me to think that the news was actually news and not just an endless stream of paid advertisers! Many business spend their marketing dollars on "news" programs to make it appear that their highly sought after. And not only do most people believe it, they ask for second helpings. I'm not a news watcher. The headlines make me crazy. Even public radio and TV can get under my skin. Donor is just another word for commercial and the bigger the donation, the more they get in attention. We've come to a point in our society where young people are wrapped up in branding and marketing and turned into products. We steal their childhood before they even realize it's lost. Screaming teens are big dollar signs. Figure out how to create a hormone surge and they'll hand over their money. It's been going on for a long time, think The Beatles or Michael Jackson, but I think it's getting worse. Twilight, Lady Gaga, Justin Bieber. Big flash. And it all comes at lightning speed. I anticipate one day that Justin Bieber will be in rehab for the fourth time or marrying his third wife, looking to find what's missing in his life. Oops. It's your childhood. Gone forever, but here's another Bentley. His head will look even more like Donald Trumps than it does now. The screaming girls will be gone, but the hangers on will still be there continuing to take just one more piece. You can use any of your favorite spices or leave it out. Heat a large skillet over medium high heat. Quickly add a bag of frozen corn (or fresh kernels cut off the cob), 2 TB real butter, a pinch of dried thyme, and stir until corn is crisp tender. It doesn't take very long. Season with salt and pepper to taste. At a restaurant, my mom will peruse the menu like it's her last meal. The wait staff will often appear three times before she's had enough time. My son is baffled by McDonald's drive through window. "Wait, WAIT, I'm not ready." I'm not like that, although I do feel a bit pressured at drive through windows and often revert to whatever I normally order just because I didn't see that new salad that they've got displayed in a gorgeous picture by the window where you pay. We're not frequent diners at places where you get your food through windows. McD's is a great, relatively low cal place to get an ice cream cone. It's cheaper than DQ and I think tastes better. But, I'm a little put off at the taped welcome voice that pushes the latest whatever burger or implores me to try an iced mocha today. I always say no thank you to the recording and then feel really stupid when the completely different voiced person then takes my order and seems to not understand why I'm no thanking them. I think my mom reads from menus so deliberately and completely because she's from a generation that just moved slower. It's ok really, not a slam, I think it's a good thing. I love all things slow and really hate it when someone I'm with is compelled to look at their chirping electronic device rather than be with me. Really, what is it about those leashes that have made us all rude? What will 100 years bring? Absolutely no human contact of any kind? So, anyway, back to slowing down. 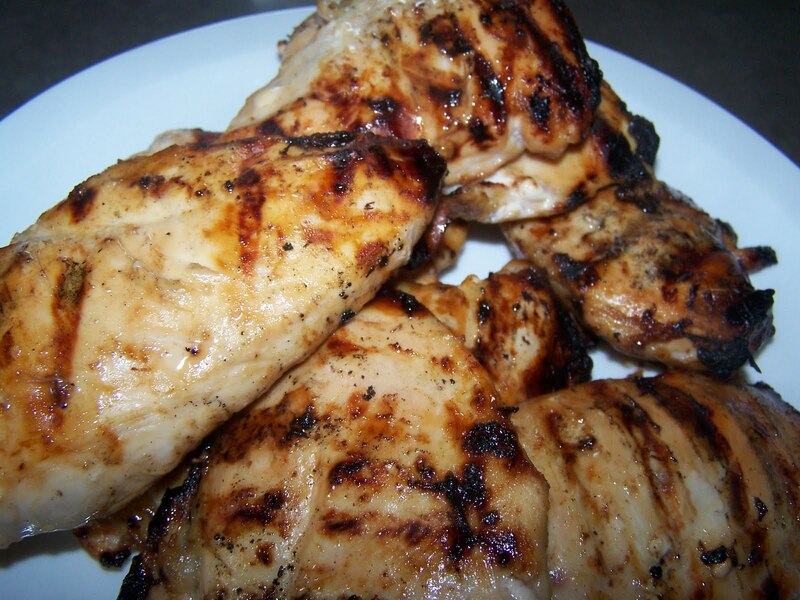 I can't eat grilled food all the time, so here's one of my go to recipes for summer. It simmers in your crock pot all day and is great for those days when standing over a 600 degree grill just seems wrong. Take a big old pork roast, loin is good, but way too expensive to cook until it falls apart. Put it in your crock pot. Dump in a good bottle of beer and more garlic than you think you can stand. Salt and pepper to taste and let it cook all day. Shred, put on buns and top with bbq sauce and cole slaw. Freeze leftovers to do the same thing in the future when it's too hot or your too busy too cook. Makes a great tortilla stuffer too. I'm always surprised by how very little liquid you actually need to marinate with. This marinade goes together quickly and was a hit with my family and one of Sam's friends when used on chicken. We especially liked the leftovers the next day cut up and tossed with a big veggie salad. I think it would be great on steak and pork too. Place all in a zip bag. Add desired meat and let marinate for at least 4 hours in the refrigerator. Longer is better. 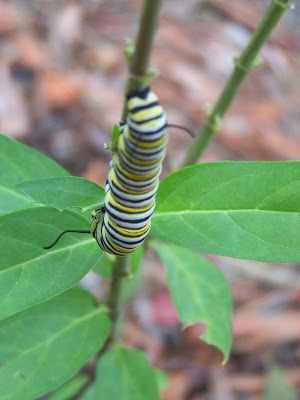 Remove from marinade and grill. I hate to tell people that I'm a housewife. You get that look of condescension and perhaps a little pity. Some, a very rare few, will say, "hardest job on Earth." And they're right and I want to kiss them which makes for a very awkward moment in Minnesota Land of Very Defined Personal Space. I've developed many answers over the years. Queen of the Mean Vacuum gets the most puzzled looks. (Where have all the funny people gone?) SuperMom is the shortened version that most people seem to appreciate and understand. There are some days that I really feel valued and like I'm making a contribution. Yes, I do this (insert mundane task here) and because I do this (insert mundane task here), D doesn't have to worry about it. He can make the bacon in peace. But, it's mostly when I'm baking that I feel like I'm making a warm and happy home. Not warm in the literal sense of what in the heck are you doing turning on the oven when the air conditioning is on, but you know what I mean. Anyway, then comes out Suzie Homemaker Household Engineer and SuperWife. I brandish my spatula and whip up some kind of sweet hug for my boys. This was one of those days. As you can see by the picture, it was well received. I've separated the recipe by crust and filling. This is my go to single crust recipe. It takes 5 minutes and is flaky and fantabulous. And if you serve it to me, I'll know you've visited my blog! I can't keep this one to myself, it's just too good and too easy to not share. I'm sure you could double it and then roll out or piece together a top crust. Preheat oven to 400. 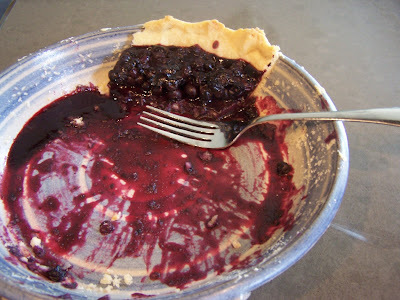 Mix all with a fork, press in a pie pan, flute the edges, and poke the bottom with the same fork. Bake 12-15 minutes or until edges begin to brown. Then cool and fill to your heart's delight. This is really easy, but don't tell them that! Bring to a boil, stirring constantly until berries just begin to pop. Pour filling over berries in the pie shell. Chill and serve. I love it just as is, but if you want to go completely over the top, serve with vanilla bean ice cream or real whipping cream. Pay No Attention to the (wo)Man behind the curtain! Do you have terrible headaches? You may have Pseudotumor Cerebri like I do! Mayo Clinic Pseudotumor Cerebri Information. Get info from where I was diagnosed after 2 years of suffering and frustrating doctors appointments!